HOUSTON – Even with the rapid embrace of life as the franchise player for the Houston Rockets, something still troubles All-Star guard James Harden about the way his departure unfolded with the Oklahoma City Thunder: Why didn't officials give him longer than an hour to consider a final four-year, $54 million offer before trading him? Asked if additional time might have caused him to accept a deal several million dollars short of the $60 million maximum contract Harden had long sought, he responded: "Who knows? Another day, who knows what another day would've done?" Looking back a week later, Harden believes he likely had to leave his sixth-man role in Oklahoma City and become what Houston general manager Daryl Morey calls the Rockets' "foundational player" for the public to truly understand the depth of Harden's abilities. "I was there with talented guys in Oklahoma City, some All-Star guys, and I would've been in the back seat there – which I was fine with – but I wouldn't have gotten the chance to show how talented I really am," Harden said. "It's a different opportunity for me here." Thunder and Rockets executives give the same explanation for the timing of the trade four days prior to the Oct. 31 deadline for contract extensions: Houston needed a deal done on that Saturday, because Rockets officials felt that was the bare minimum to assure they could get their eventual five-year, $80 million deal with Harden into place. Houston had been pressing hard to complete the trade on that Friday, but Thunder GM Sam Presti waited until Saturday to present his final offer with a 60-minute deadline to accept. Presti believed the Thunder would've lost leverage in potential trade packages if rivals weren't sure they could keep Harden off the restricted free-agent market next summer. Oklahoma City traded Harden, Cole Aldrich, Daequan Cook and Lazar Hayward to the Rockets for Kevin Martin, Jeremy Lamb and two first-round draft picks. For the Thunder, the trading of Harden was a financial decision. The organization wasn't willing to deal with the punishing luxury-tax consequences and restricted roster flexibility that would come with paying a third player beyond Kevin Durant and Russell Westbrook a maximum contract. Oklahoma City had drafted Harden with the third overall pick in the 2009 NBA draft, and he rapidly developed into a 2012 All-Star and gold-medal-winning player for Team USA in the London Olympics. Harden has made an immense impact on the Rockets: Back-to-back games of 37 and 45 points in victories earned him Western Conference Player of the Week honors. Most of all, the performances affirmed his readiness to be a leading man. Harden insists he's embraced the role of franchise player, of team builder, of the star responsible for setting the tone. 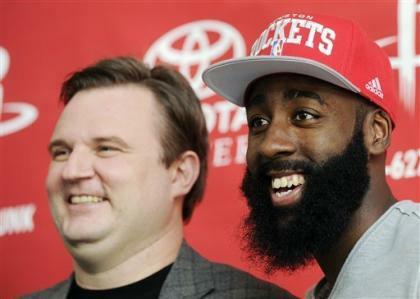 "That's why they brought me here for: to embrace the leadership, to embrace building the camaraderie," Harden said. On the way out of Oklahoma City, Harden has been naturally aware of the public debate his contract talks and eventual trade inspired. 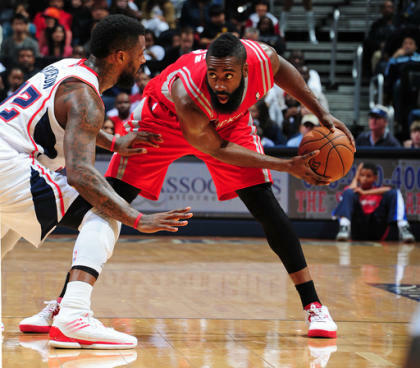 "Everybody has their own opinion about me [as a role player and focus of a team]. I can do both: I'm versatile. Growing up in college, in high school, I was the focal point. I was the leader. I was the go-to guy. I was the third overall pick. I took a back seat and did whatever it took for the team to win. Some nights I scored, some nights I passed. Whatever was needed to win. "Now, I'm back to my old ways: Needing to be the leader, needing to score. In any situation, I'm going to be good."